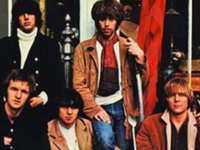 One of the best ’60s San Francisco bands, Moby Grape were also one of the most versatile. Although they are most often identified with the psychedelic scene, their specialty was combining all sorts of roots music — folk, blues, country, and classic rock & roll — with some Summer of Love vibes and multi-layered, triple-guitar arrangements. All of those elements only truly coalesced, however, for their 1967 debut LP. Although subsequent albums had more good moments than many listeners are aware of, a combination of personal problems and bad management effectively killed off the group by the end of the 1960s. Many San Francisco bands of the era were assembled by recent immigrants to the area, but Moby Grape had even more tenuous roots in the region than most when they formed. Matthew Katz, who managed the Jefferson Airplane in their early days, helped put together Moby Grape around Skip Spence. Spence, a legendarily colorful Canadian native whose first instrument was the guitar, had played drums in the Airplane’s first lineup at the instigation of Marty Balin. Spence left the Airplane after their first album, and reverted to his natural guitarist and songwriting role for the Grape (the Airplane had already recorded some of his compositions). Guitarist Jerry Miller and drummer Don Stevenson were recruited from the Northwest bar band the Frantics; guitarist Peter Lewis had played in Southern California surf bands like the Cornells; and bassist Bob Mosley had also played with outfits from Southern California. The group’s relative unfamiliarity with each other may have sown seeds for their future problems, but they jelled surprisingly quickly, with all five members contributing more or less equally to the songwriting on their self-titled debut (1967). Moby Grape remains their signature statement, though the folk-rock and country-rock worked better than the boogies; “Omaha,” “Sittin’ by the Window,” “Changes,” and “Lazy Me” are some of their best songs. Columbia Records, though, damaged the band’s credibility with over-hype, releasing no less than five singles from the LP simultaneously. Worse, three members of the group were caught consorting with underage girls. Though charges were eventually dropped, the legal hassles, combined with an increasingly strained relationship with manager Katz, sapped the band’s drive. Moby Grape’s follow-up, the double-LP Wow, was one of the most disappointing records of the ’60s, in light of the high expectations fostered by the debut. The studio half of the package had much more erratic songwriting than the first recording, and the group members didn’t blend their instrumental and vocal skills nearly as well. The “bonus” disc was almost a total waste, consisting of bad jams. Spence departed while the album was being recorded in New York in 1968, as a result of a famous incident in which he entered the studio with a fire axe, apparently intending to use it on Stevenson. Committed to New York’s Bellevue Hospital, he did re-emerge to record a wonderful acid folk solo album at the end of 1968, but that would be his only notable post-Grape project; he struggled with mental illness until he died in 1998.